The American College of Greece introduces a new chapter in its 140-year long history by launching a new visual identity for the organization as a whole, as well as for its three educational divisions: The Pierce Gymnasium and Lyceum, Deree – which offers Undergraduate and Graduate studies, and the Alba Graduate Business School. 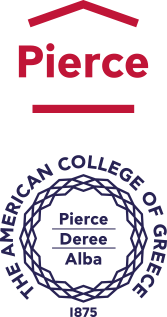 The new visual identity highlights the College’s organizational structure that unifies Pierce, Deree, and Alba under one academic “roof” with a shared educational mission. The contemporary seal of the College is complemented by an icon symbolizing the academic “home,” a center of knowledge and development for every student who joins the ACG family. The launch of the new identity coincides with the celebration of 140 years since The American College of Greece was established, and symbolizes ACG’s contemporary course within its long, pioneering history. The new visual identity was created by the award winning design group Beetroot. Watch the new ACG identity concept video here.